With much attention focused this summer on heavyweight champion James "Cinderella Man" Braddock (a hit movie and two major books), it is not surprising that significant items representative of Braddock are part of next October�s auction of the most significant boxing collection in recent memory. 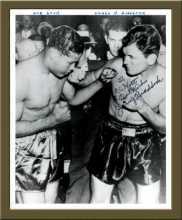 Geppi�s Memorabilia Road Show, in a major auction that will culminate October 27 (the boxing collection on the 25th), will be spotlighting the legendary collection of the late Stanley Weston and his daughter Toby Weston Cone, a collection that was once part of Madison Square Garden�s "Boxing Hall of Fame." A Braddock vs. Louis "Official" Comiskey Park Ribbon, a posed photo of Braddock and Louis, signed by Braddock, two working press passes, two photo passes, a dressing room pass, an "official pass," four full tickets (varying colors), and a Ted Carroll "Heroes in Defeat" drawing, noting Braddock�s loss. Other Braddock items include six negatives, featuring Braddock as an older man, a Ted Carroll "Irish Ring Heroes" drawing, and four laminated newspaper articles pertaining to Braddock fights. The items are part of the massive collection, which includes the well publicized letter written and signed by Jack Johnson, detailing his "fixing" of his fight against Jess Willard, an array of gloves, trunks, bags, ephemera, original art, and priceless championship belts. "It is an honor to represent this important, historic collection, and a pleasure to have been working with Toby Weston Cone, who lovingly tended to this collection begun by her father, and now being made available to collectors everywhere," noted Steve Geppi, the company president. A major outreach to Europe is included in the marketing plans for the collection, where boxing memorabilia is especially valued. The auction, by phone, fax and email, will also include the Bert Padell Collection, the largest single collection since Barry Halper, and the Arthur Richman Collection, from the longtime sportswriter and club executive, and consignments from Orioles great Brooks Robinson.